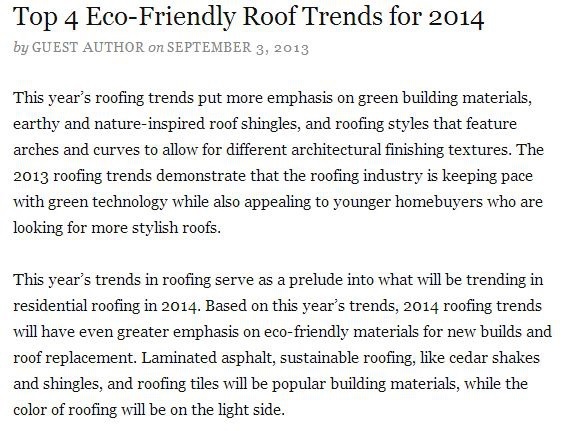 The world is going green and even roofers and building material manufacturers are following the movement. This year, you can help spur the eco-revolution and help Mother Nature by asking your Menlo Park roofing contractor to install energy-efficient materials in your home. “Solar roofing systems will be front and center in 2014, especially with the mandate from the California Energy Commission that requires all new residential and commercial buildings in the state to have solar-ready roofs by January 1, 2014,” explains Janisch. Janisch also says that the popular asphalt shingles will remain a roof favorite due to their durability and stylistic flexibility. Its variant – laminate asphalt shingles – is also going to face higher demand. Energy-efficient composite shingles and asphalt shingles with cooling granules are also predicted to skyrocket in sales. With its ability to reduce heat buildup, reflective roof coating is also bound to be popular this year. Its popularity is an indicator of the overall momentum of the cool roofing trend, as homeowners are recognizing they need to install cool roofs to make their interiors more comfortable during summer months. Lighter and neutral roof colors are bound to pop up everywhere as well, as having roofs of these hues can also effectively lessen heat absorption. With this year all about earthiness and the grays, homeowners are assured that a neutral palette will give them everything but the blues. It is significant that concerns with a home’s heat absorption and energy efficiency levels are fueling these trends. For a resident of sunny Menlo Park, this makes the trends far harder to ignore. Of course, these trends must be adopted only if recommended by professionals. For advice, contact only a reputable specialist in residential roofing in Menlo Park, CA like Shelton Roofing.